What makes your brand newsworthy? “What makes something newsworthy?” is a question I am often asked by clients, contacts and colleagues. It can be a head scratcher at times but it is a plausible question because if your business doesn’t have anything new to announce, how can you achieve brand awareness in places where your customers will see you? Like most marketing communication agencies they had placed their client’s brand awareness at the forefront of priorities. 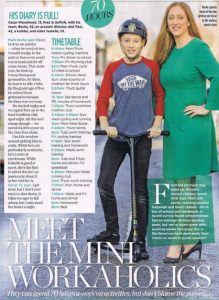 Our Account Director Becky has a full on work schedule in addition to dedicating a whopping 70 hours a week to helping her son Oscar achieve his dream of becoming a sportsman. Wonder Woman or what?! Her story alongside some of the UK’s busiest mums was featured in Woman Magazine and then the Daily Mail got their hands on it too! Our Head of Commercial enlightened us on his weekend hobby – Geocaching. I know Waitrose Magazine has a regular section featuring those who do different things at weekends so I pitched in his hobby and here he is. 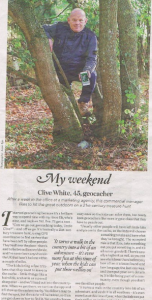 Alistair Wayne, our MD, always has interesting and action-packed days at work so Cambridge News included him in their weekly feature Working Day. In addition to these stories from the Media Managers team, the office move from Cambridge to Bury St. Edmunds earlier in the year generated local coverage as well as myself and Clive presenting at an Eastern Daily Press business masterclass about social media and traditional advertising. The moral of the story here is if you want to achieve organic brand awareness then get talking to marketing communication professionals! PR can never be guaranteed due to national news stories sometimes consuming the headlines or a conflict of interest but if you work with experts who have the right contacts and know what journalists are seeking and when then it’s a pretty good start. If generating positive brand awareness in the media is a priority for your business then why not give us a call to see how we can help. By Ellie Banahan| 2017-05-09T10:53:38+00:00	May 8th, 2017|Uncategorized|Comments Off on What makes your brand newsworthy?